We’ve all been there; it’s primary school, you and your friends are goofing around, when suddenly someone gets a little too rough and gets a pencil jabbed under their skin. That marks stays with you most of your life, and although unfortunate, is actually a very common thing. In fact, it’s so common that people have a name for it: graphite tattoo. There are some people, however, who are worried about what this means for them in the long run. Is it toxic? Will it go away? We’ve taken the liberty of answering some of those questions for you. Graphite is a crystalline form of carbon mineral. It is used in a variety of industrial processes, from acting as a dry lubricant in heavy machinery and acting as moderators in nuclear reactors, to its most common form: pencil tip. Is Graphite The Same as Charcoal? No, but they are similar. Charcoal is usually made from burnt-up pieces of natural matter, usually wood. Graphite, on the other hand, is a naturally occurring mineral that’s found in rocks. Most people ask this because they encounter both materials in the same room, due to the fact that both graphite and charcoal are used for art projects and can be used to write with. However, they have key differences. Charcoal is usually very brittle, flaky, fragile, and doesn’t adhere to paper as well as graphite. Graphite, on the other hand, has a Mohs Scale of Hardness level of 1 or 2, which makes it quite soft. This also gives it structure, and is usually less prone to turning into dust. It also sticks to surface better than charcoal and, because it is non-reactive, can be mixed in with other pigments to create colored graphite. What is a Graphite Tattoo? 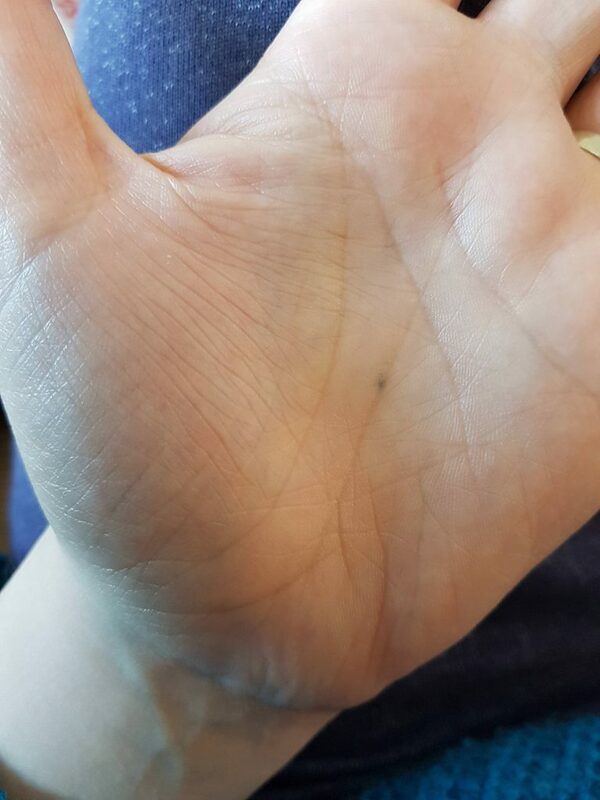 A graphite tattoo is a result of a graphite-tipped pencil (most, if not all, pencils are now made from graphite and clay) getting under the skin and leaving a mark. It’s also called a pencil tattoo. These aren’t exactly formal terms; despite its commonality, many people thought that their graphite tattoo is unique, which is why no one ever thought of giving it a name. It was only recently, however, when people on social media started bringing it up and found out that thousands of other people share the same mark. Graphite ranges from a medium-grey to jet-black. In its natural form, it is both metallic and opaque. However, if it enters your skin, it leaves behind a dull, greyish color that fades over time but doesn’t completely disappear. On paper, graphite has a slight sheen to it, with a grey color that intensifies into black depending on the amount of pressure you use to draw or write with. The same can be said about a graphite tattoo: the harder it was pressed into your skin, the darker it will. Some graphite tattoos are colored black, while others have a medium to light grey. Most ‘graphite tattoos’ are the result of a pencil tip piercing the skin. Nowadays, pencils are made from a combination of graphite and clay, and is generally non-toxic, even if ingested (although that’s not recommended either!). One of the common misconceptions about graphite tattoos is that it is dangerous. This usually stems from the fact that earlier pencils, like the ones from the early 20th century. However, as time passed and people became aware of the toxicity of lead, they replaced pencil tips with graphite, a minimally-toxic and bountiful material. The myth of the lead pencil, however, persisted. Why Does Graphite Leave a “Tattoo”? Here’s where it gets interesting. Contrary to popular belief, these graphite tattoos aren’t solid lumps of graphite trapped under the skin: they’re actually tattoos. Being jabbed by a pencil is kind of like getting a stick-and-poke tattoo. Normal tattoos have to be drawn on by inserting a needle underneath the epidermis and applying the ink on the dermis layer of the skin. Stick-and-poke tattooing is the same concept, only much more primitive and a little more painful. Pencils do the exact same thing: once they breach the epidermal layer of the skin, they leave behind their “ink”, which is actually graphite particles, in the dermis, where they remain undisturbed and unabsorbed by the skin. What Health Risks Are Associated With Graphite Tattoos? Like what was mentioned earlier, graphite is generally non-toxic. Unless you have massive amounts of graphite stuck into you (which is doubtful), it will usually have no ill-effects whatsoever. The only health risk associated with graphite tattoos is the actual method of application. Since most graphite tattoos are accidental, there’s a chance that the pencil that was jabbed into your skin wasn’t sterilized, which could lead to infection. If a piece of solid graphite breaks off into the skin, it has to be removed carefully as well. Deep puncture wounds can also happen, and should be given immediate medical attention. Graphite POWDER, on the other hand, does have a few health risks. Prolonged inhalation of tiny amounts of graphite powder over a period of years can cause benign pneumoconiosis, a lung condition that causes constant coughing, shortness of breath, fibrosis, and inflammation. Graphite powder can also aggravate (but not cause) symptoms of asthma, emphysema, and other problems with your respiratory functions. However, this usually doesn’t happen with pencil graphite, as the latter is in a form that is very much safe for human use and does not pose a health risk. Because of its non-toxicity, graphite is also not poisonous if ingested. Again, you shouldn’t ingest it in the first place, but if you somehow accidentally do, don’t worry, but maybe drink a whole lot of water to flush it out. Much like regular tattoos, graphite tattoos fade over time, although they’ll still be noticeable for decades and may not permanently disappear on their own. Usually, the only way to get rid of a graphite tattoo is via laser treatment. Laser tattoo removal works by sending out a beam of light to break up the ink, or in this case, the graphite particles. If that’s not an option, just wait it out; at best, it’ll be an interesting story to tell in the future! Do Graphite Tattoos Pose a Long-Term Health Threat? No. Most studies involving the long-term health risks of prolonged graphite exposure are usually related to the inhalation of graphite powder, which is a material that’s mostly used by artists or engineers. Currently, there is no conclusive evidence, let alone a body of study, that has determined a health risk related to graphite tattoos.